Owned by James Powell & Sons from 1834, the Whitefriars glassworks (later Whitefriars Glass Limited), produced glass of the highest quality until the business closed in 1980. In 1834 James Powell, a successful London wine merchant, bought the Whitefriars Glassworks. At the time when the company made very high quality art glass on a par with the output of Loetz in Europe and Tiffany in the USA. Whitefriars exhibited at all the major international glass exhibitions and won many awards. They made fine quality historismus glass and they were part of the avant garde of the Arts and Crafts movement. They manufactured beautiful art nouveau glass pieces, and when Venetian glass was all the rage in London, James Powell and Sons were producing some of the finest reproduction Venetian glass in the world. At the start of the 20th century the Whitefriars factory was between Fleet Street and the River Thames. In 1923, a new factory was opened in Wealdstone near Harrow, northwest London. The new furnaces were lit using the flame from one of the old works furnaces. The flame had been carefully carried across London in a brazier. The company also had showrooms on Wigmore Street, and this attracted customers from both the domestic and window glass markets. In spite of there long tradition of producing very fine art glass, the Whitefriars Glassworks is best known for its industrial art glass, which was made from the 1920’s onwards and after Harry Powell had retired. Geoffrey Baxter was one of the many well-known glass designers who worked at Whitefriars. He joined the factory in 1954 after graduating from the Royal College of Art. Baxter had a great influence on Whitefriars table and domestic glass designs. 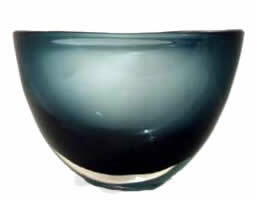 In the 1960s, baxter began to experiment with a new moulded glass. In 1963, the company changed its name to Whitefriars Glass Limited. In 1967, they introduced the Textured range. The pieces were made in moulds using tree bark, nails, wire and other materials to produce alternative textures to the glass. Whitefriars or Powell glass is normally marked with a paper label, but these have often been lost over the years. However, most of the later designs and colours are so distinctive that it is easy to identify post-1930 Powell glass. However Whitefriars continued to design and produce high quality glass right to the end, but their sales were never enough to cover their costs and the company was placed in receivership, made bankrupt, and closed down. Fortunately, the company records and numerous pieces of glassware were given to the Museum of London. Baxter was an extraordinary British glass designer of the post-war period. He worked with Whitefriars Glass from 1954 until 1980 designing a wide range of domestic glassware. By the age of 14 Baxter was attending the Guilford School of Art and by the early 1950s he had gained a place at the Royal College of Art to study in the newly established Department of Industrial Glass. Through his extensive studies he earned a First Class honours degree and a travelling scholarship to the British School in Rome in 1953, this was the first time anyone from the design industry had received this award. On graduating Geoffrey Baxter was immediately employed by William Wilson, managing director and chief designer at Whitefriars Glass, as his assistant. He was the first employee at Whitefriars to have been chosen from outside family business. By the end of the 1950s Geoffrey Baxter was designing most of the domestic glass going into production at Whitefriars. Baxter’s style was highly distinctive, and though he was influenced by the movement of Scandinavian Modern at the time, his own purity and elegance went into creating glassware that was highly successful in the British market. Baxter helped create a revolution in colour as he developed Artic Blue and Ocean Green in 1959, followed by Midnight Blue and Shadow Green in 1962. During the post-war period Whitefrairs Glass were second only to Stourbridge glass who manufactured expensive full-lead crystal and used the traditional heavily cut design. 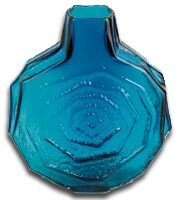 However, Whitefriars incorporated continental-style soda glass in most of their products. Not only was the material cheaper to make it also allowed the designers to have flexibility in form as well as colour. Geofrey Baxter revolutionised the texture of British glassware producing rough surfaces unlike any previously seen in British glassware.